A gorgeous collection of favourite nursery rhymes. This sturdy board book has easy-to-turn pages suitable for little fingers, and a glittery cover! 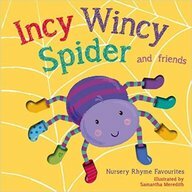 Packed with old favourites, such as Old MacDonald Had A Farm, Incy Wincy Spider and three Blind Mice - its the perfect first introduction to nursery rhymes..